End Connections: UNF 3/4" - 16 or NPT 1/2" or NPT 3/8"
Cryoandmore´s Super Insulated Vacuum Lines are the perfect solution for applications requiring the safe and efficient Transfer of liquid Nitrogen or other cryogens. 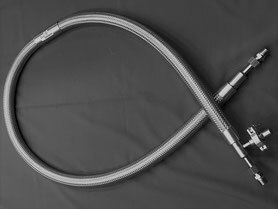 Anywhere that cryogenic liquids are used in processing vacuum jacketed transfer hoses can ensure the highest quality liquid is delivered to the use point. A maintenance check is adviced every 12 months on all cryogenic Equipment. Cryoandmore offers a choise of site based maintenance contract and will refurbish/ upgrade products. All dimensions are changeable to meet your specifications, please send us your needs to info@cryoandmore.de to get a quote.